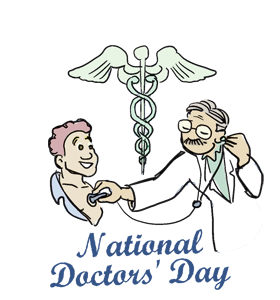 ﻿National Doctors' Day: Calendar, History, Tweets, Facts, Quotes & Activities. National Doctor's Day commemorates the nation's doctors, who have dedicated themselves to public service by helping to ensure the good health of US citizens. Doctors are qualified and licensed individuals who practice medicine of all forms. They include many types such as physicians, surgeons, specialists, anesthesiologists and pediatricians, who dedicate their lives to helping, healing and curing the sick and needy. President George W. Bush designated March 30th as National Doctor's Day on October 30, 1990 in an effort to celebrate the sacrifices and contributions made by our nation's doctors. National Doctor's Day is observed on March 30th every year in the US. Eudora Almond, wife of Dr. Charles Almond, celebrated the first Doctor's Day in Winder, Georgia on March 30, 1933. People pay the doctor for his trouble; for his kindness-they still remain in his debt. - Seneca, ancient Roman philosopher. Order a gift for your doctor. Find something related to medicine such as a spine keychain or even a basket of fruits shaped like bones. Send a personal Thank You Note to your doctor letting them know you appreciate him/her. Drop by your doctor's office with a free lunch or a snack in appreciation of their dedication towards your health. If you haven't been for a check up in a while, get one. Your doctor will be happy that you came in.